Faced with the decision of how to fill your summer days and which events to attend this year, we hope to aid you in this strenuous process. We can’t choose for you, but we have compiled a list of our top 10 festival essentials to ease the kit list making; all the things you might need for that special weekend (or longer), preparing yourself for the outdoors and helping to make the trip as memorable as possible. Portable Energy Some of us can’t bear to live without our mobile phone. Some of us are snap happy and can’t bear to part with our camera. For us, the number one top tip for ensuring you don’t miss out on sharing your favourite song live with your friends at home, or capturing a hilarious moment straight away is to keep a Solar Charger with you this Summer. 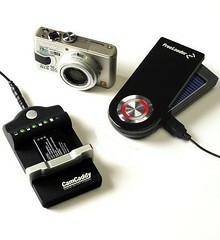 Let it charge out in the sun for a few hours and then give your phone and camera the boost of charge that it needs. I would always recommend the Freeloader Pro – reliable, powerful and can charge nearly all types of camera batteries, but we have a wide range available – there will undoubtedly be one to suit your needs. Hayfever Relief I suffer from hay fever in early summer as I’m sure many of you do too. Make sure you keep your allergies at bay by not forgetting to stock up on some effective allergy relief. Our customers here at Ethical Superstore love HayMax, a natural and organic way of blocking pollen before the symptoms of hay fever arise. It’s available in Lavender, Frankincense and Pure fragrances too. Portable Light Don’t get caught trying to find the portaloo in the dark this year – make sure you keep a torch with you! We stock loads of eco-friendly torches here at Ethical Superstore, but the wind up PowerPlus Owl stands out as the best for camping, perfect for carrying to the nearest loo or friends tent, and great for perching on your camping table whilst having a drink or two. Food & Drink Nobody wants to run out of food and miss out on the action by having to travel somewhere to buy in supplies – so buy them beforehand and stock up with food that will last. Snacks like dried fruit, Bombay mix and crisps are recommended supplies to keep on the go, and why not consider non-dairy alternatives to milk? These keep longer than fresh dairy milk and also come in a variety of flavours. Aren’t festivals the times to try something new? Ready meals and tins like our tasty organic range from Free & Easy are ideal to take when camping, easy to store and easy to cook.Same goes for drinks too. Have you tried our Fairtrade Coconut or Mango beer? Festivals are perfect for sharing, so stock up on plenty in case a friendly neighbour takes a liking to your Fairtrade Chocolate or Ubuntu Fairtrade Cola, and don’t forget it’s a great opportunity to raise awareness of some of the great eco-friendly produce around and convert your friends and those you meet. Picnic Plates Complete the camping experience with proper camping gear. Light My Fire, the pioneers of the Spork produce widely coveted outdoor accessories, popular with all those addicted to the Great Outdoors. 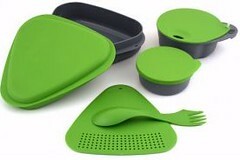 The outdoor meal kit is the ideal pack for the party camper, two plates, a spill-free cup, colander, cutting board, spork and more, all packing neatly into the environmentally friendly plastic case (which forms the two plates). Tent Pegs Durable and surprisingly strong, the Biodegradable Tent Pegs from GreenStake begin to biodegrade after months in the ground. So if you accidentally leave a tent peg or two by accident in the mad rush to pack up, no worries – there will be no trace of it when you return the following year! Camp Fire No camping experience is complete without some kind of campfire, or at the very least a barbecue. 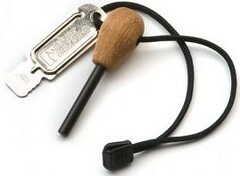 There’s no better way to start a fire in style than with the Sweedish Firesteel Firelighter from Light My Fire, small enough to fit in your pocket, but so powerful that it’s used by armies all around the world and can even start a fire when wet. Portable Shower There’s a queue for the showers. It’s muddy. It’s smelly. You really want a shower, but don’t want to miss out on waiting for one. If only you had a portable shower all of your own? Sure, you’ve got some cold water you could wash under – but it’s colder than you were expecting and you can’t bear the thought of being colder. 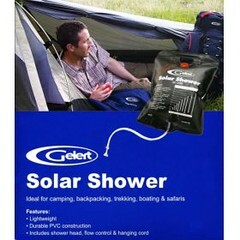 Well, the eighth in our list of Festival Essentials is the Solar Shower! Lightweight and durable, the solar shower can be warmed in the sun and then used as a portable, refreshing shower whenever you need it. Music On The Go For when the live music ceases or is too far away to hear it any longer, then it’s time to bring out the Wind Up Radio, music, news and more by the power of your hand. Brilliant! B in Bags The volume of rubbish festivals and large events accumulate is frightening. Leave no trace behind – take some Degradable Refuse Sacks with you. Nilaqua – Washing With No Water!